The David Awards Supreme Winner, David Rouse of Auckland Auto Clinic, flanked by HP’s Personal Systems Group Marketing Manager Warwick Grey, and awards organiser, Heather Douglas, of HomebizBuzz. 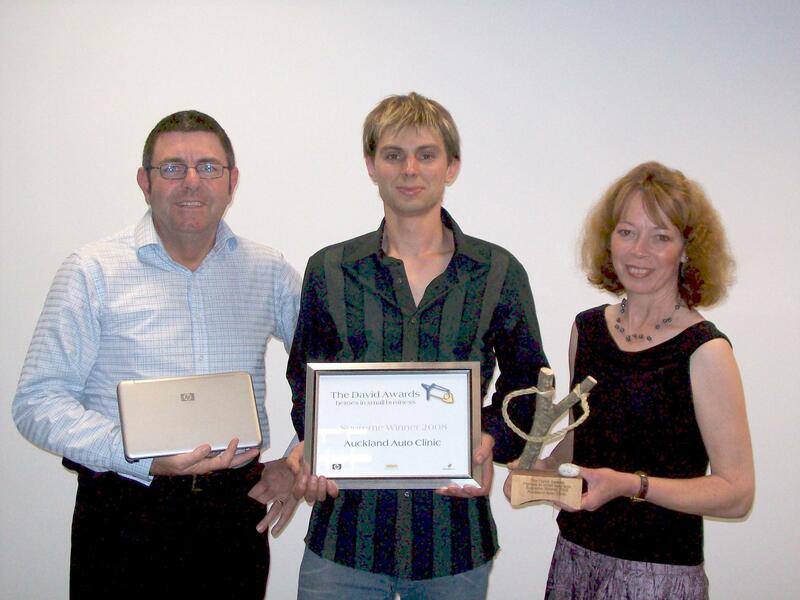 New Zealand’s best little business has not only been named, but has earned itself a brand new HP notebook mini, a new set of office furniture from Warehouse Stationery, and the honour of being crowned Supreme Award winner in the inaugural year of The David Awards: heroes in small business. David Rouse’s Auckland Auto Clinic has not only taken out the Supreme Award, but also the category awards for The Most Outstanding Transitional Business, The Most Outstanding Triumph Over Adversity and The Most Socially Responsible Business. Winners were announced during a live web broadcast which can be viewed at www.thedavidawards.co.nz. This is a business which is under two years young, smart, quirky, or just very professionally set up. Jackie Teague-Thomas started her rental property management business with little experience and big goals – and the results prove she is well on her way to building a successful, profitable and highly scalable business. A promising business between 18 months and 5 years old, which has a proven track record and some or all of the plans/people/systems/processes in place to make a well-above-average future a reality. Auckland Auto Clinic has gone from being a home-based business run on the side to now employing nine staff and being poised for significant further growth. Paying attention to systems, processes, staff, branding and home grown customer service has paid of for this business. MOST OUTSTANDING TRIUMPH OVER ADVERSITY. A business which has succeeded in spite of challenges beyond the usual. After a business partnership turned sour, the owner took on additional debt and faced potential bankruptcy to start rebuilding from scratch. Today, the three competitors it initially had in its local area have grown to 10 – and yet its customers, suppliers and staff testify it is the shining star among them. This award is for a business which epitomises the ability to integrate business and lifestyle, with the owner(s) to take advantage of its flexibility to fit income generation around spending time on family or leisure activities or other pursuits. When Rob and Jane Scott got into printing photos onto canvas, it quickly grew from a hobby into a business – and one which allows them to live in the country, work to their own timetable, give back to the community and make the most of the glorious opportunities they have on their doorstep. This award recognises a business which either demonstrates a new or clever way of going about things, or is quirky from the ground up while incorporating great business principles. Both these businesses are real kiwi success stories. eSource’s IntelliSwitch product is cleverly designed to save people money on their power bills and power consumption in general, while The Wrangler was invented by farmers wanting to find a better way to restrain cows for easier and more effective handling. Simple, clever concepts make it effective and unique. A business which leverages technology in many guises to enhance efficiency, mobility and keep overheads to a minimum. The judges were at pains to point out this award was not given for the business selling technology, but rather one which used technology effectively. Backload Moving Company finds real solutions for people wanting to save money on their household relocation while improving the efficiency of the small independent removal operator. Its smart use of technology has allowed Beth Holbrook’s business to grow while reducing her workload. Constant innovation means technology is constantly introduced and adapted to streamline the way business is done. This award recognises a business which punches above its weight in terms of getting the word out, achieving profile and attracting business. Wilco and Waverley Klein Ovink have developed a brand as unique as their product. The Wrangler has grown steadily through word of mouth, internet and industry focused marketing and is now poised on the brink of international success. This business stood out for the way it supports its staff, for example, encouraging them to take their sick days off for wellness activities, and by pledging a percentage of profits to the Westpac Rescue Helicopter and other community initiatives. It showed not just lip service, but a real commitment to giving something back. Auto Auckland Clinic takes home a whole new office full of furniture from Warehouse Stationery, a notebook mini from HP, online advertising for a year from HomebizBuzz.co.nz, a consultation, book and Cuefile organiser from organiser extraordinaire Robyn Pearce, and a trophy by Smashing Gifts and Promotions. Category winners receive prizes books and other prizes, as well as certificates.